Double your donations in NYC and Westchester! Anyone who’s been in New York over the past few years will know that there’ve been huge changes afoot in many of our public spaces. From Times Square to Union Square to Bliss Plaza in Sunnyside Queens, lovely open community spaces both big and small are being freed of traffic and built out and expanded and greened and brightened up, and New Yorkers love them. We stop by in droves with bag lunches, or for a chat, or a rest, or a bit of shade or sun, or to meet someone new. NYC plazas seem to be here to stay. What many New Yorkers may not see, though, is how many thousands of busy hands are at work to make these spaces the vibrant community hubs they are – or how much time, money, and love go into maintaining and constantly improving them. Seems easy enough, right? Block off traffic and throw in a few planters? Well, no. Turning a plaza into a real community space is actually super hard, expensive work. So today, we want to highlight an exciting Neighborhood Plaza Partnership (NPP) campaign. NPP is a program under the fabulous Horticultural Society of New York, or “the Hort,” for those in the know. The campaign, called WePlaza!, brings together improvement initiatives coming down the pipeline at three plazas in Queens and Brooklyn. Always on the lookout for new ways to fund plaza improvements, these three projects have come together to do a crowd-resourcing test run of sorts. “Part of our mission,” explains Dorothy Le, director of capacity building at NPP, “is to work with plaza groups to see what kind of tools we can use, and crowd sourcing is potentially one of them.” If this test run in crowd resourcing is successful, the futures of NYC plazas will look that much more secure. “Seeing the possibilities that exist in these spaces is a really positive thing, and really opens up creative avenues for community members, whether they’re arts groups or educational groups, or whether they’re simply waiting for the train,” Le says. So check out the awesome WePlaza! video teaser on their campaign page, and meet the leaders of the three initiatives, below. See if any of them calls to you! When arts group Recreate Queens put out a public call, recently, for local performers to take the “stage” this summer at Bliss Plaza, they were immediately flooded with over 40 applications. Things were off to a good start, to put it mildly. To learn more, and to donate, click here. Coming soon to Corona Plaza, Queens: free wifi! By this summer, you should be able to stroll through the space and log right in. Best of all, users will be directed, upon signing in for the free Wifi, to a main Corona Plaza community page. The site, will highlight community and educational events at the plaza, and promotions by local businesses. An information fair for immigrants might be advertised, for example, or an event along health and wellness themes. Or a notice about an open-air Zumba class next Friday night might pop up. Ricardi Calixte, Deputy Director of the Queens Economic Development Corporation, is eager to see how this main page might bring together a community in which not everyone has wifi at home, and not everyone is aware of all the neighborhood has to offer. The community, he notes, is a largely immigrant one, and largely working class. To donate, visit the project’s campaign page here. Maria Nikolovski, an architecture student at Pratt, walks through Fulton Plaza all the time, on her way to school, or to Fulton Street’s hip cafes and restaurants. She and her peers have always wanted to create a piece of work for their Fort Greene/Clinton Hill community, but until now, they’ve never had the chance. The funding wasn’t there, and local projects weren’t a part of their coursework. Most Pratt architecture student projects over the years have actually been abroad. So when student design group PrattSIDE came into some grant funding, they knew just how to use it. Coming to Fulton Plaza: a graceful shade canopy, made exclusively of steel and rope. Why steel and rope? They’re cheap, easy to use, and malleable (which will come in handy when the structure is moved, after its first 11 months, to an undecided new location). The inspiration came from the local community, via PrattSIDE’s partner, the Fulton Area Business Alliance (FAB); residents had reported that what they most wanted in the plaza was shade, shade, shade. The sun can be harsh in the Fort Greene/Clinton Hill area; mini parks abound, but in the in-between areas, you’re liable to get scorched. To read more and donate, click here. 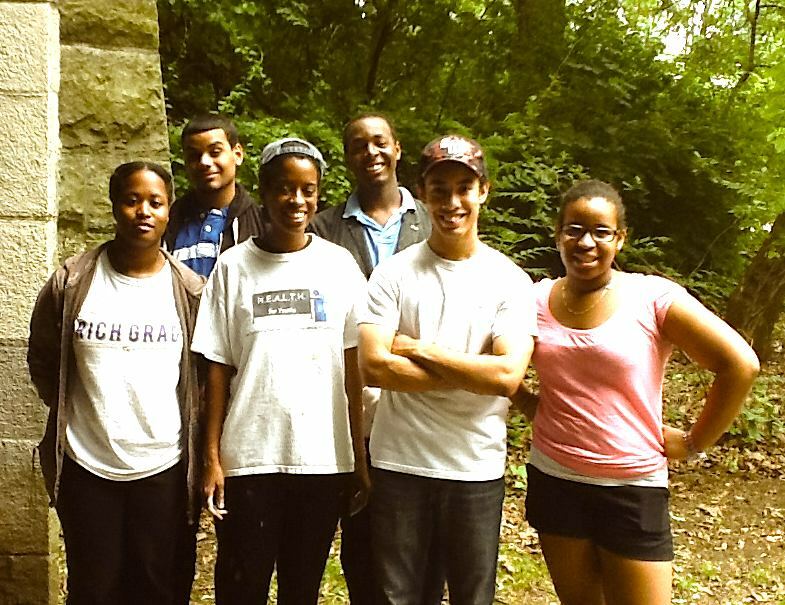 Hey New Yorkers, did you know that there are over 20 miles of hiking trails in Van Cortlandt Park, up in the Bronx? That its 1,146 acres contain a golf course, a stable, and a house that George Washington slept in? That you can still go there and find green spaces that are actually wild? New Yorkers pride themselves on knowing their city like the back of their hands, but few of us know that the third largest park in the big apple is the sprawling Van Cortlandt Park. A New York Times article shed light last year on why most New Yorkers don’t know parks like Van Cortlandt as well as they should, and why parks in the outer boroughs have historically gotten so much less attention – and money – than Central Park has. In a nutshell: wealthy donors tend to live near, and therefore feel most invested in, the parks that are already doing quite well, which has left the others pretty much out in the cold. That hasn’t stopped the tireless Friends of Van Cortlandt Park (FVCP), a nonprofit founded in 1992 in response to exactly that problem, from giving Van Cortlandt the TLC, the respect, and the use that it deserves. They do incredible work in sustainability, forest restoration, and urban gardening in their beloved green space, and have evolved over the years to become the park’s primary free educational organization. Each year, they teach more than 5,000 students – and not just children, but adults as well. Of the many programs they offer, one in particular is skyrocketing right now. “Our garden program has quickly become our most popular program,” says FVCP executive director Christina Taylor. “We get more volunteers on our garden days than we do on our forest restoration days. Everyone loves it.” FVCP’s garden is an ideal place for parents to bring their kids and show them how tomatoes come from soil and sun, not from the grocery store; it’s a controlled and contained, and yet wild, natural classroom. The perfect balance. “Something as simple as counting the cucumbers that are growing – they love it. With the compost bins, they get to see worms and hold worms,” says Taylor, of the sheer delight that the garden has brought to its littlest stakeholders. Older kids are getting in on the fun, too. FVCP, through a partnership with Grow NYC, helps to run green markets for youths in the neighborhood, scraps from which come back to the garden to be composted. There are other signs that the neighbors want to get more involved with FVCP’s garden: they’re showing up with their own kitchen scraps at Taylor’s office door. Literally. “People will show up at the door with food scraps,” she says, “and be like ‘hey, is there room in your freezer?’” In the summer, if she happens to have been offsite for a few days, unexpected compost drop-offs can result in pungent mishaps. But Taylor laughs when she talks about it; carting spoiled compost to the trash may stink, but it shows that people are hooked. Garden-mania in the neighborhood, in other words, is at a fever pitch. The problem is that the current garden needs a face-lift. Its first 400 sq. ft. raised growing bed was built on the cheap, of low-quality wood, in 2008, and is badly rotted. Well-loved shovels, rakes, and other tools are breaking down left and right, literally losing their handles. From our perspective, this is all a good sign: FVCP’s garden has run through its first round of equipment and is going stronger than ever. We can imagine the hundreds of stories of positive community change told by each dent, each missing handle, each rusted piece of equipment. But new shovels don’t grow on trees, so FVCP is raising money through ioby for round two. Hand pruners, rakes, wheelbarrows, you name it. “We’d also like to get a new storage container to put these tools in that we’re buying,” says Taylor. “Right now our storage for the tools ends up being that we lay them on the ground and put the wheelbarrow on top of them, and that’s how we protect them from rain.” Not a rust-proof system. For the raised bed that needs rebuilding, the money will go to fresh lumber (of a much hardier quality, this time), brackets, and soil to mix with the compost. So pitch in a shovel or a rake for the holidays, all ye New Yorkers who talk about there being no green space in our city. This is one of those wonderful cases in which you can see very concretely how far your donation will go: $10 or so for a new shovel, which will see the fingerprints of hundreds of happy Bronx gardeners over the years to come. And check out the hugely exciting 20-year master plan recently put together by NYC Parks for Van Cortlandt; it includes plans for a community garden at least five or six times the size of the current site. Onward! “Resilience” is a word you hear a lot in the aftermath of a disaster. Indeed, it’s critical to think about how we can be less vulnerable in the future. In New York City during Hurricane Sandy, we saw firsthand how a downed transportation system can bring the city to a halt. After the earthquake in Haiti, we talked a lot about how to make buildings more stable by improving building codes. These conversations are incredibly important, and help us to plan for what we hope will never happen. I have been thinking about what it takes to be resilient for a while. Before joining ioby as staff, I worked at the United Nations Development Programme as a Climate Change Policy Specialist. I supported national governments to address climate change within their countries and at the negotiating table at the UNFCCC negotiations. In my work, I spoke with people addressing disasters around the world: the floods in Pakistan, earthquake in Japan, typhoons in the Philippines and other tragedies. Here is what I learned: resilience is personal. When the storm hits, it’s the things that you barely thought about before the disaster that are crucial. Questions that you probably never asked yourself before in any urgent way: How can I get food and water? How can I communicate with my family and friends? If I need to leave my home, how do I get out? In my experience, people that could answer questions like these are much more resilient to the impacts of the disaster. And in New York City, we saw this vividly – stories of the elderly stuck in apartments at the tops of buildings with no way to get food or power. They depended on the incredible army of relief workers, volunteers and concerned citizens to bring them supplies. By getting their personal needs met, they were more resilient. This is why I am proud of ioby’s report after Hurricane Sandy. While there have been many important discussions about how we can improve larger infrastructure – like energy grids, buildings and transportation systems – to be less vulnerable to erratic storms, ioby’s is the first to make this personal. When we asked people for ideas, we didn’t know what we would get. And the responses surprised in all sorts of good ways. Many suggestions are wildly practical and don’t cost a lot of money. Ideas like having a “buddy” in your apartment building to make sure that everyone is accounted for after a disaster. Imagine how that would have helped in the days following Sandy? Or Katrina? I hope this is just the beginning of more efforts to talk about resilience from the personal perspective. There is no doubt that we need to rebuild in smarter, stronger ways and it will require good ideas from everyone so that, if a storm like Sandy comes our way again, we will be ready with good answers to the unexpected questions. A thirty-minute subway ride from downtown Manhattan, at the very northern end of the island in Washington Heights, is Highbridge Park. Like most New York City neighborhoods, Washington Heights has its fair share of bodegas, barbershops, and restaurants. But Highbridge Park’s crowning glory, Ft. George Hill, makes this neighborhood different. A rugged mass rising directly to the right of the subway exit, the hill is home to the only mountain bike trails in Manhattan—winding, two-foot wide paths through a forest, over knotted logs, up and down mossy boulders, and beyond what you thought you knew about New York City’s parks. Before Highbridge Park was a mountain-biker favorite, it was a mess. 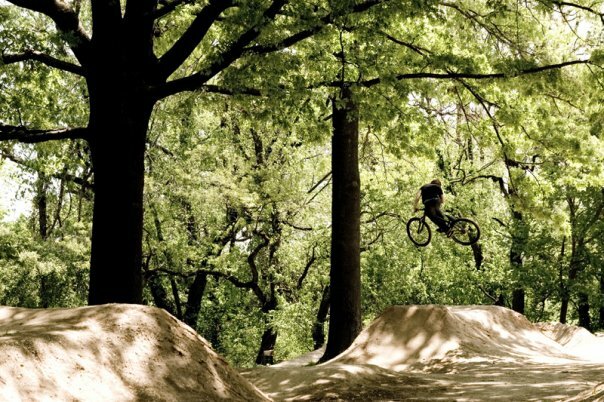 The International Mountain Biking Association (IMBA), a non-profit that evaluated the condition of the park in 2005, noted that it had been “a refuge for drug dealing, prostitution, and illegal dumping.” The joint efforts of the Regional Trails Program, the New York City Mountain Bike Association (NYCMTB), and IMBA resulted in the park’s transformation, removing several truckloads of trash and over 1,200 hypodermic needles during the process. None of this would have been possible without the advocacy efforts of IMBA, the co-founders of the NYCMTB, Dawson Smith and Jamie Bogner, and Concerned Long Island Mountain Bicyclists (CLIMB). The combined activism of these groups convinced the New York City Department of Parks and Recreation to allow the trails to be built, marking the first time since 1991 that bikes were allowed off-road in the city’s parks. The design included some beginner trails, a number of intermediate and advanced trails, and a BMX dirt jump course. The amount of advanced trails outweighs beginner trails, however, leaving less options for novice riders to practice the sport. The only other two mountain bike parks in New York, each of which offer more beginner trails, are located far away from Manhattan. Creating more trails and improving existing ones in Highbridge Park could make cycling—especially mountain biking—more accessible in New York City. But Highbridge Park is a long way away from reaching its full potential. The area is littered with beer cans, plastic bags, coffee cups, graffiti, construction tarps from a nearby work site, and enough broken glass to make any cyclist cringe. This trash is often discarded when pedestrians forgo the sidewalk at the edge of the park for a more direct route between Dyckman St, Ft. George Hill, and Ft. George Ave. What’s more, the frequent of passage of people through the bike park has contributed to the erosion of the hill and a deterioration of the trails that the NYCMTB fought so hard to create just eight years ago. Thankfully, the NYCMTB is only $1,610 away from being able to actively engage both the park and the community by building new trails. These trails will offer more beginner-level courses for young New Yorkers looking to start mountain biking, while the more advanced courses will continue to challenge more experienced riders and provide serious aerobic activity. NYCMTB will also offer instructional courses teaching the basics of mountain biking and the importance of exercise to local youth. “There’s a lot of interest from the kids, as well as parents,” added Smith. “We want it to be a local place that kids can go and enjoy programs where they can spend a small portion of their day just exercising.” This comes at a time when childhood obesity across the U.S. is at an all time high. Encouraging kids to be more active is important, but this project is about more than just biking. It’s about instilling an interest in park stewardship in the local youth groups that will help build the trails. Working alongside professionals, these kids will learn erosion control techniques and will be proud of the park that they built with their own hands. The story of Highbridge Park, albeit incomplete, is a point of pride for neighborhood residents who are used to seeing the park as a haven for crime, not for recreation. “People are happy to know that there’s a positive use going on in this section of the park,” notes Smith. “All it needs is some positive to drive out the negative.” The group is currently awaiting approval of the course design and for proper funding to break ground. You can help here. Video for Volunteers 101 – Feb 28, 2012 register now! Video is something everyone can use as a tool to create social change. Video for Volunteers 101 is designed to get you started creating video content that you can use to build awareness, raise funds and tell the world all about the great work you’ve undertaken. We’ll cover basic concepts of video creation, guidelines for planning your video, the fundamentals of shooting and strategies for editing your piece. Our goal is to put the power of video in your hands. Training is done in partnership with ioby and Good Eye Video. Good Eye Video is a video production company for non-profits. They produce, educate and strategize with organizations trying to tell their stories. They believe in the radical idea that every human being has a story that can change the world. They believe video can make it happen. ioby thinks they’re right. RSVP here, please.